I don�t understand why but Microsoft Outlook doesn�t provide an easy mechanism for users to download images that may be embedded inside an email message. You can right-click an inline image in Outlook and copy it to the clipboard but there�s no option to you save that picture on to a local folder. Option #a: You can copy the image to the clipboard and paste it into a photo editing tool like Paint or Photoshop. Option #b: Open the email message and save it as an HTML file (File -> Save As -> Web page) - this will save all the embedded pictures in one folder. 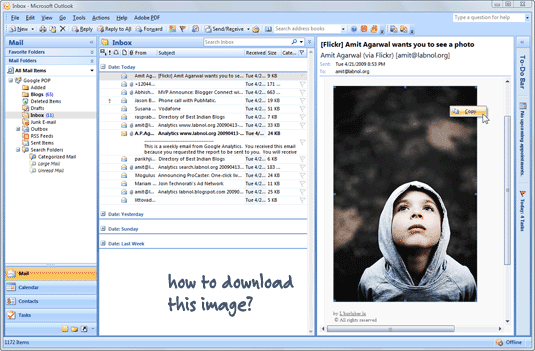 It�s the same trick that�s often used to extract pictures from PowerPoint slide-shows and is recommended when you want to download multiple images from the same message. Option #c: This is my favorite. Open the e-mail message and under the Message tab, select Other Actions -> View in Browser. This would open your mail inside the default web browser as a regular HTML web page and you can right-click to save an embedded picture. Trick #c probably works with Office 2007 only so if you are using an earlier version of Outlook, please use the #b option.